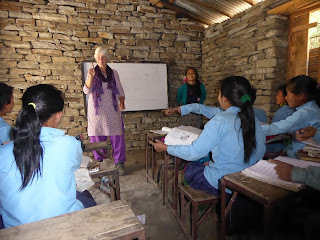 Much of the teaching I have witnessed in rural Nepal has been where teachers expect pupils to learn by rote. In these lessons there is very little pupil interaction or individual contributions and instead frequent use of whole class chanting to encourage pupils to learn by heart, rather than an emphasis on understanding. Although I agree that learning some things by heart is essential, involving pupils in active learning is also important and effective. Through sharing skills and showing Nepali teachers different ways of working with pupils, teaching volunteers from Western cultures can help them to become more confident to try different methods in their lessons and help their students to learn more effectively. 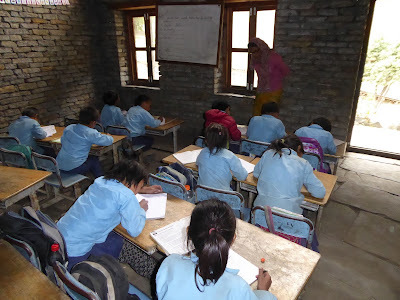 This is the aim of our work with schools in the Sirdibas area. My colleague playing with ECD children on the floor. 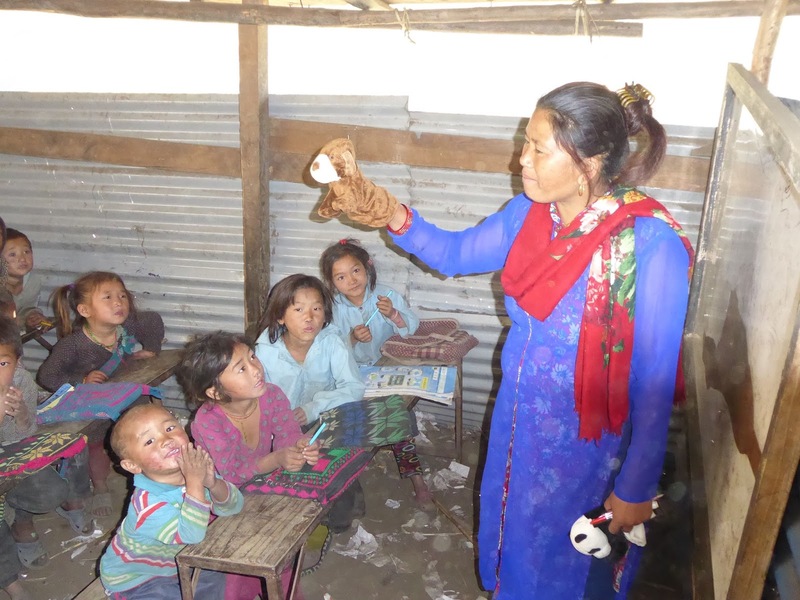 There is no culture in Nepal of learning through play and most classrooms for the youngest students (called Early Childhood Development - E.C.D.) appear to have little or no play equipment. By modelling playing with and without structured equipment and by playing simple learning games, it is possible to show teachers how much more involved their pupils become and that they do actually learn too. for 10 year olds with a game of Simon Says. We found some ECD equipment in a store room and showed teachers how to use these resources as part of their lessons. The use of puppets enthralled the younger children and they enjoyed the picture story books the teacher read to them. 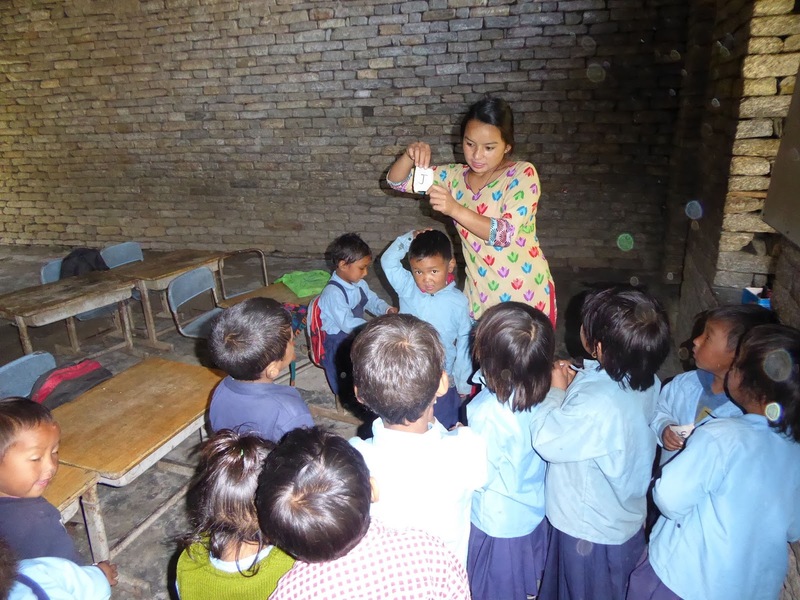 Games like 'Simon Says' and 'Hangman' can be played with no special equipment in an English class and encourage the children to think and learn in a different way. Students laugh and have fun and don't realise they are learning and practising what they have learnt. Letter cards in a game instead of just writing on the board. By providing card and felt-tip pens, and showing teachers ways of using these to make flashcards and simple games to support their lessons, we hope to encourage them to be more adventurous in their teaching. This can be a quick and easy way of involving pupils in their learning. There is much more we can do to help these teachers, but it takes time to build trust. Hopefully during the next three years we will see teachers become more confident to try the new methods we have demonstrated. We know that not all teachers will change their practise, but, with support, those that do will find that many of their pupils learn in a different and more enjoyable way.